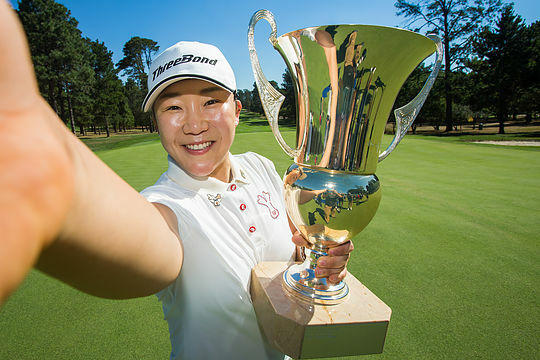 Jiyai Shin’s love affair with Australia continued as she came from three strokes behind Minjee Lee to claim the ActewAGL Canberra Classic by six strokes for her 50th career win and her second at Royal Canberra Golf Club. The 29-year-old from South Korea, who was known as the ‘final-round Queen’ when she held the world number one spot from 2010-2011, opened with rounds of 65 and 68, followed by an eight-under-par 64 when it most mattered, highlighted by an eagle at the 15th, seven birdies and one bogey, to end on a three-round total of 19-under-par. Although Lee birdied the seventh, she then dropped shots at the eighth and ninth to give Shin the advantage. She recovered from another bogey on the 10th with a birdie on the 12th, but Shin moved five ahead when she holed a nerveless putt for eagle on the 15th from 25 feet. An untidy bogey from Lee on the par-5 18th gave Shin the opportunity to move further ahead with a chip and putt from the front of the green for birdie. “From the start, I wasn’t hitting it that solid, so I don’t think I hit it that well or putted that well and I had one-over, but it is what it is,” Lee said. With three successive rounds of 68, the long-hitting Dutchwoman Anne Van Dam moved up into third position on 12-under-par, which booked her place in next week’s Women’s Australian Open at Kooyonga Golf Club in Adelaide. Pernilla Lindberg kept close to the leaders all day but bogeyed the last two holes to end in fourth position, with Holly Clyburn in fifth and Beth Allen in sixth. Aditi Ashok and Kylie Henry tied for seventh place, followed by Leticia Ras-Anderica, Georgia Hall and Caroline Hedwall in a share of ninth. This was Shin’s third win in Australia, following her most recent at the 2016 RACV Ladies Masters and she will be gunning for a fourth in Adelaide this week.